Note: This is the third article that I’ve written about Survivor Benefit Plan (SBP). You should read this with the other two articles. That way, you can formulate your own educated opinion about your personal situation. This article is also the basis for a chapter for an ebook, Guide to the Survivor Benefit Plan, currently available on Amazon. I’ve written several articles about the Survivor Benefit Plan (SBP). Both articles received some unanticipated pushback from different people. The first article received some pushback from several fee-only financial planners and financial counselors who work with military personnel. These people told me that SBP is a very expensive annuity when compared to other options (it is an annuity, and its terms are defined by law). They also told me that I should advise EVERYONE to steer clear of SBP. The second article, outlined reasons you should strongly consider NOT purchasing SBP. I wrote the second article partially in response to those planners. However, there were some folks who asked me if there was a better option. This article got a lot of pushbackfrom people who are champions of SBP. Many of these folks are concerned that today’s servicemembers aren’t properly educated about SBP. My intended message was that you should consider not purchasing SBP. However, my article came away sounding like you should not get SBP, and get a term insurance policy instead. In fact, my personal opinion is somewhere in between. I believe that SBP makes sense in some situations. However, there are situations in which a term life insurance makes sense in a lot of situations. Before we go further, we should clarify that I don’t make a dime from any insurance recommendations. My recommendations are purely based upon my analysis of a particular situation. I compared SBP to a term insurance policy because SBP is much better than commercial annuity products. And there is a lot of risk in trying to build a portfolio on your own…you might die before you get anywhere close to being able to replicate SBP. So the counterbalance to that risk is a life insurance policy. Term life insurance is generally the cheapest kind of life insurance. It’s definitely better than trying to build value in a whole life, universal life, variable life, or variable universal life (VUL) policy. You might wonder why I wrote an article that seemed to advocate SBP, then followed it up with an article that seemed like SBP-bashing. I did so for two reasons. First, both articles seek to provoke critical thinking…I think I soundly met that objective. 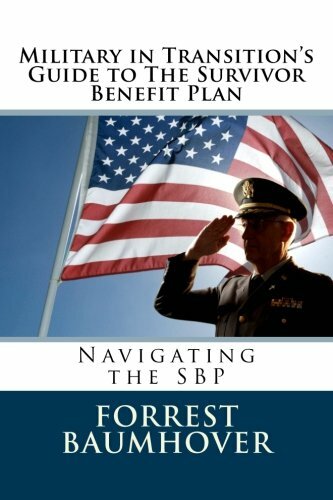 Second, putting those two articles side by side shows my true focus…when you’re looking at your decision to retire from the military, you need to make sure you address SBP properly. With that said, I got hit up on both sides of the debate. First, each situation is different. If this seems repetitive, then good. I want you to understand that your situation is not exactly like anyone else’s, so you need to educate yourself and form your best opinion. If you need to hire someone to help you, by all means, do so. If you’re confident in your ability to gather the relevant facts, that’s great. However, you still need to do the analysis or have it done for you so you can make your decision. Second, since each situation is different, I believe that you cannot universally prescribe a ‘one-size fits all’ solution that is best for everyone. You can prescribe a ‘one-size fits all’ solution that generally works for most people (like SBP does, or like a term life policy does). However, it occurred to me that if you read one article without the other, it appears that I’m only advocating that course of action…or my tone indicates that I have an agenda. I don’t. Third, I really appreciate the discourse from both sides (even if I felt like the punching bag both times). This indicates to me that there a lot of people who are doing a lot of hard work to help others, and I’m very glad to be a part of this community. Personally, I think the decision to choose (or not choose) SBP is an individual one. I’ve tried to structure my articles to emphasize that decision, not a preconceived notion of a one-size fits all solution. Hopefully this works. There are many situations where SBP may not adequately address a financial need, or is a more expensive alternative to term life insurance. For example, SBP may not be a good choice for female servicemembers. Women are statistically more likely to outlive their male spouses. Unless there’s a significant age difference, it just doesn’t make sense. It might not be the best use of money for people who are otherwise financially stable and don’t need to rely upon a pension because their post-military career and choices have more than made up for it. However, there are also situations where SBP makes perfect sense: an older male with a much younger female spouse may benefit from SBP for a very LONG time (at least she will…). For example, my grandmother outlived my grandfather for 30 years (she was 2 years older) and received SBP the whole time. So for a male servicemember marrying a second wife who is 10 years younger, this makes perfect sense, since she’ll likely benefit for 40 years or more. SBP also makes sense if there are health-related insurability concerns that can make term insurance unaffordable, or even unattainable. Also, if you outlive a 30 year term policy, you get nothing. Conversely, SBP is guaranteed for life. If you choose a life insurance policy over SBP, you need to take this into account. There are also situations where the decision isn’t so clear. For example, a lot of people feel they may be on the right track to retirement. Perhaps the retirement plan includes having that inflation-adjusted pension, retirement assets and social security. However, what happens if you’re in your 40s or 50s (prime earning years with the highest living expenses for most people), and something disastrous happens? Your beneficiary might receive a guaranteed pension…but that doesn’t replace the expected income or the assets you expected to accumulate over time. Nor can you expect it to cover living costs while paying a mortgage and supporting kids at home. So, I decided to write a third article that attempts to outline a particular situation. While this doesn’t reflect everyone’s situation, I think it’s a pretty common one. In fact, it’s my personal situation. I’m a 40-year old soon to be military retiree in decent (not Ironman excellent) health. My family has 3 children, a mortgage, one car payment (very low interest), a couple of small student loans (less than $10K total). My wife is 1 year older than me, and my children are in elementary school, with two dogs, two canaries, and a lizard (uromastyx, if you’re interested). In other words, nothing unusual, and probably a situation a lot of people can identify with. Let’s start by identifying my financial need. My number one concern is the financial risk to my family if I die in the first 20 years after my military retirement. Why 20 years? After age 60+, I expect to have accumulated enough assets for my wife to pay her living expenses and provide for herself after I die, even without my military pension. We will have paid off our house and possibly even downsized, and our children will have been long gone, so her living expenses will be much lower. Before that point, though, my wife will be looking at having to handle our pre-retirement expenses, and my plan needs to address that. In my situation, I could either obtain SBP or a term insurance policy. My SBP would protect approximately $4,000 in monthly income (providing a $2,200 monthly payout, with annual COLA increases), for about $260. Since this is pre-tax money, that comes to about $195 per month after taxes. For that $195, I’ve been able to get underwriting on a 30-year, $1.5 million insurance policy. I’m using a 30-year policy as a ‘just-in-case.’ I believe that 20 years would be sufficient to reach our financial goals, but I’m willing to purchase a 30 year policy to eliminate any doubt. We will compare the SBP payout (55% of $4,000 or $2,200 per month) to the cash flow that a $1.5 million payout would provide. Peace of mind should be your number one priority. If SBP is your answer & nothing will change your mind, do not read further. However, this article does attempt compare SBP to another option which might better address your situation. If even the thought of some investment risk (even US Government-backed securities or bank CDs) scares you, stop. While this discussion goes into scenarios with very low, achievable investment returns, which can be reasonably achieved with very safe investments, such as a treasury bond ladder or CDs, nothing is ever guaranteed. This article assumes fairly low COLA (inflation) rates. This could change, and should be considered accordingly. However, the assumptions are generally in line with inflation rates used by financial planners. This article ONLY addresses the cash flow issues that happen when there is a sudden loss of income before there are enough retirement assets to support living expenses. For this example, I’m primarily concerned about my wife raising our 3 children and paying the mortgage if I die in my 40s. I’m not as concerned about cash flow needs in our 70s. By the time we reach retirement age, our plan is to have enough retirement assets not have to rely upon my pension (or SBP payout) for her to afford her living expenses. In this case, term insurance provides protection against a defined insurable need: the sudden cessation of pension income while you’re still building your retirement assets. This article doesn’t try to compare whether SBP is cheaper than insurance. 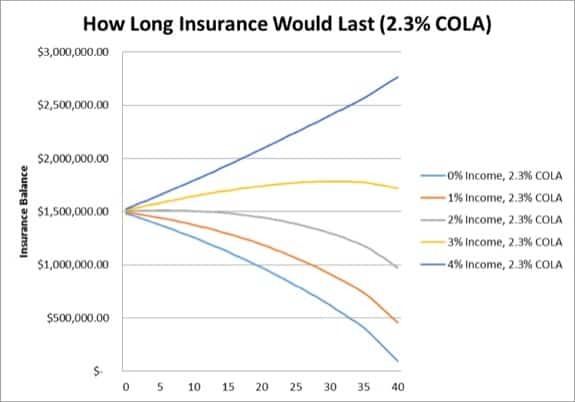 I’m using information from my previous article, where I outlined how much insurance I would be able to purchase with the amount of money I’d otherwise use for SBP. You may find that you can buy more or less insurance, based upon your particular situation. This article does not attempt to compare the amount invested in SBP vs. the amount invested in the insurance policy. It assumes that the same premium would purchase either the guaranteed SBP payout, or a certain amount of life insurance. In this case, the comparison is between the SBP coverage of a $4,000 pension (which is $2,200 per month), or a $1.5 million payout. Your situation may allow for a lower or higher payout. Whether you die at Year 1 or a Year 29, you will have paid approximately the same amount for either outcome. This situation assumes that at the end of a 30-year term policy, you will have enough retirement assets to offset your SBP benefit. If you’re not comfortable with the fact that in Year 31, your pension could go to zero, stop. Choosing the Survivor Benefit Plan is better for your risk tolerance. There are worse things than outliving a 30 year term policy. However, you might be concerned about the thought of getting nothing for that money. Look at it this way: it’s the exact same result as if the servicemember outlives their spouse…you keep your WHOLE pension. In the meanwhile, the insurance policy protected you against that downside risk of losing your post-military earnings. This article assumes your insurable need is for a 30 year term policy. You may find lower rates (or a higher insurance policy for approximately the same premium) if you’re willing to accept a 20 year term, which some people may be willing to do if they are older and/or closer to financial independence. This article assumes that SBP proceeds are 100% taxable, while the insurance payout is not. However, earnings on the principal are taxable. We will assume the 25% tax rate from the previous article. This article does not assume any special needs, or any situations other than what I explained above. If your situation is significantly different from the one outlined above, you may have to do your own analysis to figure out what is right for you. In fact, you should analyze your own personal situation. It is YOUR life and you need to OWN your decisions. If you want, you can go to the DOD Actuary website and download an Excel file that does the exact same thing I’m about to do: compare the numbers and give you a recommendation as to whether or not SBP or term life insurance is better for your situation. Caveats out of the way, let’s get to work comparing the two scenarios. Returns: We will adjust the COLA for SBP and hypothetical investment returns for the payout. These hypothetical investment returns are very low. In fact, the highest rate, 4%, is a generally accepted distribution rate in the financial planning industry that still allows for the long-term preservation of capital. However, anything above the US-Government 30 Year Treasury rate (currently at 2.75%) involves some sort of investment risk, however slight. Calculating distribution: Instead of just assuming a 4% distribution rate, as was done in the previous article, we’re comparing the guaranteed $2,200 monthly pension (adjusted annually for cost of living allowance increases), to how long a $1.5 million policy would last, if set aside and used to match the after-tax SBP payout. For example, at a 4% annual COLA adjustment, the $26,400 in Year One will become $27,456 in Year Two. After tax, this becomes $19,800 and $20,592, respectively. The distribution from the lump sum investment will match this, first with earnings, then with principal. The calculations reflect the tax impact from earnings, but zero taxation on principal. For the illustrations in this article, I’ve used a 40 year time horizon. At the bottom of each illustration is a bullet point summary of how much money you would have at the end of this period, as well as the SBP break-even point. Illustration 1 represents the break-even point with an annual COLA adjustment of 4%. 4% is a very high number, especially in light of recent COLA increases. However, most financial planners use 3-4 percent as an inflation assumption when preparing financial plans, so 4% is a conservative estimate (on the high side), just to demonstrate the likely worst-case scenario. As you can see, even with a 4% COLA, there is no situation in which a $1.5 million portfolio would last less than 30 years. The SBP break-even point is at least 35 years for any of these scenarios. Even if you took the money and put it under a mattress, you would be able to match the SBP payout for 35 years. And at a 4% income, you end up with more money than you started with at the end of 40 years! Although it’s not in the chart, 30-year Treasury rates were around 2.75% as of March 11, 2016. Assuming you received the current Treasury rate, you would still have almost $600,000 at the end of 40 years. However, you could build a bond ladder, taking advantage of rising interest rates, and probably have more. So, with that information (or lack thereof), I had to turn to an ‘informal’ source. The first lead I found was from Mike at Military Pay. Mike’s website has a retirement calculator. According to his FAQ, Mike has incorporated previous COLA rates and has religiously updated the pension numbers since the War of 1812. He also uses a projected rate for future earnings. According to my napkin math, this projected rate appears to be 2.3%. So that’s the projected COLA adjustment rate for this illustration. In this illustration, you can see that there is no scenario where this payout does not last 40 years. Again, even if all you do is dole out money from under your mattress to match what you’d have received from SBP, you’d still have money left over at the end of the scenario. At the 30-year Treasury rate of 2.75%, you’d have your starting amount, and at 3%, you’d have more money than you started with. For example, let’s imagine my wife Tania used $500,000 to do whatever she needed to do, and had $1,000,000 set aside to provide her annual income. In the worst case scenario (4% annual COLA, that she matches with under the mattress money) that $1,000,000 would still be able to match the SBP payout through year 27. Instead of 108 years, $1,000,000 would get her through Year 57 under the 4% income, 2.3% COLA scenario. In addition to providing a means for a steady income, an insurance policy gives you flexibility to address immediate needs…SBP cannot offer this. Although these projections seem outlandish, they may not be, as longevity increases keep pushing the boundaries of our life expectancies. There are plausible situations where my wife could outlive me by 50-60 years, and need income into her 100s. However, that scenario is not as much of a concern to me as the liquidity and immediate cash flow concerns. In this scenario, a term insurance policy seems to be a more financially sound option than SBP. However, if I predecease my wife by 30 years or more, she might be better off with SBP. With that said, 30 years gives Tania plenty of time to take control of her life after my demise, and to find the help she needs to take move forward with her financial life. The liquidity that a term life insurance policy provides so that Tania can get through that first few years after I die. Once my term policy expires, my wife and have reached the point that she won’t need either it or SBP anymore in case I die. Recognize this is a bit longer than my normal posts, but I hope you appreciate it. Just remember, if you don’t want to do the math yourself (it’s exhausting, trust me), just go to the DOD Actuary website. Note: After I did all the research, and basically wrote this, I found the OSD Actuary’s website. I backtested my scenario against the OSD actuary’s calculator, and the calculator validated my conclusion that term insurance is more likely to provide the bigger payout when compared to SBP. However, you should run this scenario for yourself and come to your own conclusion. Previous Article: ←What’s Your Biggest Concern About Your Military Transition? Just wanted to thank you for your article. I really hadn’t thought about getting life insurance instead of SBP. I would have to pay over $450 per month to insure my daughter. The idea of getting life insurance makes sense to me. Thanks again. Thank you very much for taking the time to read it! Please feel free to share it as you wish, and if there’s any way I can help you, please let me know! for our 3 grown children. Can they be placed as beneficiaries as well on the sbp? I would hate to see all that money wasted in the event of my passing prior to him. However, you might want to decide where SBP and insurance make sense…this is something that requires much more knowledge about your finances than I currently have. It seems that you’re thinking about the right things, and you can probably make a good decision for yourself. However, you and your husband should schedule an appointment with your installation’s financial counselors. If you can’t, please feel free to contact me to discuss in more depth. My understanding about beneficiaries is if the children are dependents. Our youngest is 23, already graduated from tech school and working full time. The others are grown with children. You can also cover someone as a natural interest person. This could be a brother or sister, or in this case, your adult children. The cost is more (10% vice 5.5% or less), but it’s possible. My husband is 05 Air Force with 22 years AD. We are currently in the process of meeting with First Command for financial planning. My husband has asthma so I know his insurance rates will be high once he retires. I honestly did not know about the costs of SBP and feel like the advisor is suggesting Whole Life as a replacement, he is currently working up our plan. I am just trying to research before we go back. We do not own a home, I am 40, hubby is 47 and is looking to stay in 8 more years. Do you have any advice on if SBP is the way we should go or another insurance option, keeping the asthma in mind? Thank you so much! Hi, and thank you for writing! If insurability is a concern for you, then SBP might be appropriate, as well as VGLI. With that said, I have asthma, and had no problems obtaining a life insurance policy for myself. With regards to a whole life policy, you might want to talk to a couple of financial planners to see if that is the right fit for your situation. Whole life MIGHT be prudent if you’re carrying an existing policy and the rates are reasonably low. However, obtaining coverage in your 40s will probably mean that your whole life rates will be MUCH more expensive than the same amount of term insurance. Since the cash value of a whole life policy grows over time, it will take a while for it to build, and might not be as beneficial as buying term coverage and saving the rest. With that said, I hesitate to say more about the motives of someone you’re already working with. Before going further with First Command, I would suggest that you ask around to see who is happy, and who is not with their First Command rep.
Just to clarify, we have been with First Command since 2003. We have a small whole life policy already(75k) as well as Roth IRA’s. I have recently heard negative things about them but am afraid we have been with them for too long. I did use USAA’s insurance calculator and it came up with $180 for 500k, $350 for 1 million each were 25 year term. If I did the math right, we would pay $626 a month for SBP if hubby stays in the full 30 years. With that being 8 years away, I am unsure if we should go ahead and purchase a term policy or wait until he is closer to retirement. This is so confusing! Thank you for the quick reply, an additional insight would be appreciated! I’m not sure I can make the decision on whether SBP or a term policy makes sense for you here. I’d have to know more about your financial situation, which might not be prudent in this forum. However, if you’re wondering whether a term policy makes sense now vs later…if your husband were to die tomorrow, would you be all right with your finances as they currently stand (and existing policies)? If the answer is no, you should obtain a term policy today. If you would be financially fine, then a term policy isn’t necessary. Most people would probably not be fine with the SGLI benefits alone, and would probably need a term policy in place. The other benefit of obtaining a term policy now is that it keeps you at today’s lower rates, as opposed to rates that will be in place when your husband is 8 years older…55 would be a tough age to get a term policy, and you might not be able to get as much coverage as you want at that point. The decision to select SBP (or to buy more term insurance) really depends on your circumstances. If you’ve got a young family, mortgage debt, and lots of family-related expenses in your future, then term insurance might make more sense, since you have more at risk. However, as you put more of those things behind you (like sending your kids off to college), then your focus might be more on just the two of you. In that case, SBP might make more sense, because you are looking to protect your income (against total loss, as well as inflation). Or, you might find that it’s a good idea to protect a little of each. Fortunately, you’ve got some time to think about how your finances will change and what your priorities will be when your husband retires. Great analysis that I corroborated with other websites, so I am confident in your assessment. Thanks for answering a key question as I look to retirement. Hello! Thank you for the comparison which was a lot of great information to consider. I’m a single (for now and possibly forever) 36 going on 37 year old, no children, own a townhome for now and 1 car……I’m also nearing 20 years in the Air Force Reserves which I know Reserve Component SBP (RCSBP)is a little different. What are your recommendations for someone like me in this current situation? As a Reservist, we are able to opt to receive RCSBP at the approved retirement age so what do you think? Its selfish to say but as a single person, I haven’t really thought much about life insurance other than what I currently have which is SGLI, then VGLI then whatever else comes up. Sad but true. Thank you for the article Forrest. I am few years away from retirement (CDR w/ Coast Guard). Kids grown, mortgage almost paid, no major debts. I met with a financial advisor on base and one independent who deal w/ military and both gave conflicting answers, spreadsheets, multiple calculators and still have more questions than answers. Can someone help me with this logic: Plan to retire in a 3 years at 58 w/ 32 years under my belt. I figured my base pay be around $9K/month. SBP premium $585 pretax (probably more like $500 after tax). Just priced a 20 year term $1 million at USAA for $250 a month. USAA won’t give me a 30-year term. If I die before 20 years, (actuary says unlikely), wife who is 3 years younger gets insurance money and money lasts her fine and some…However, if I die 1 day after that 20 years is up, she gets nothing! I don’t like this option, at all. If I pay up all those 360 SBP payments, the difference between that and the insurance premium is something like $140K (200-60). If I die before that, wife will need to live an extra year or two (also per actuary numbers) to recoup that difference.